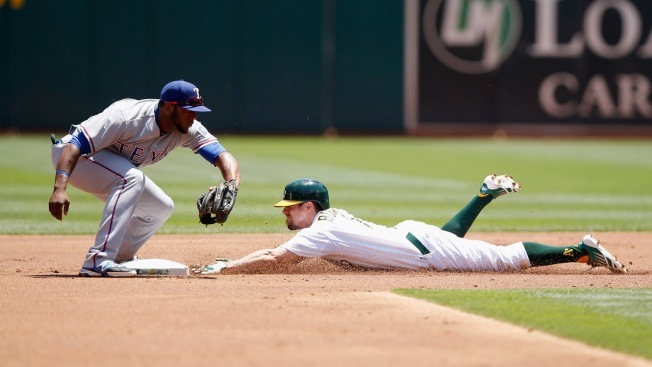 Scott Kazmir allowed one hit in eight innings to end a nine-start winless streak and lead the Oakland Athletics over the Texas Rangers 7-0 Thursday. Kazmir (3-4) retired 13 of his first 14 batters around a second-inning walk by Adam Rosales and didn't allow a hit until Elvis Andrus' one-out single to center in the fifth. Kazmir struck out six and threw 105 pitches. Evan Scribner needed nine pitches in a perfect ninth that completed the one-hitter. Kazmir defeated Texas and Houston in his first two starts of the season but had been 0-4 in nine outings since beating the Astros on April 13, although he had a 3.78 ERA in that stretch. Chi Chi Gonzalez (2-1) gave up one run, eight hits and three walks in seven innings. He had entered with 14 2-3 scoreless innings in the major leagues and was trying to become the first Texas pitcher to win his first three big league starts. Ben Zobrist hit an RBI single in the first. The A's broke open the game in a six-run eighth that included a pair of two-run homers, by Mark Canha off Jon Edwards and Josh Reddick against Ross Detwiler.